You are here: Home>Archive>Taylor Brown Collection.>Marriages.>Walter and Lillian Brown. 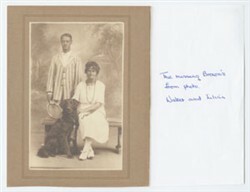 Photocopy of photograph entitled ‘Missing Browns from the photo – Walter and Lillian’. The picture shows a man standing behind a bench wearing a striped blazer and holding a tennis racquet. Sitting on the bench is a lady wearing a white dress with a long string of beads around her neck. There is a large black dog sitting on her right and she has her hand on his neck.